Yeap, you can definitely feed him in a position to add duration to the sit up, that really makes things much easier and I reward in a position as soon as they have enough duration that I can reach in in time 🙂 You can also try it on a sofa or a bed yes, it’s close enough to Bosu! Carrie — you just described my borzoi, Finn. When I started shaping with him (when he was about 3 years old) he would stand and stare because he was so used to me telling him what to do. It took a while, but now it’s hard to get him to stop moving and stand still sometimes, LOL! Yeap, sounds like she could use some shaping! The greatest thing about it is that not only teaches them to problem solve and offer action, it also teaches them that there are no wrong responds, there are just tries. It really makes a difference for dogs who don’t want to be wrong. Sure, it’s possible! It’s harder and takes longer as with fresh dogs, but it’s definitely possible, you just need to be patient and learn to be happy with little things 🙂 I start them off by clicking ANY action and always throwing treats to help them be more active. It helps to give them an object they can interact with as that gives them more ideas and then just slowly build from there. we have been on Holiday for some days and met Ayokas sister in Italy..had nice days with mounten climbing. Ayoka learned to wear a muzzle to go in the cable railway. We had an other performence on a summerfestival in a shelter. Much distraction for ayoka again, but she did well. She had lots of full speed runnings with her sister and al lot of fun. Unfortunately we are fare behind with the tricks! I have some problems with the bowls… she always wants to touch theme and didn’t get the idea to use her mouth. We are working on the hug, she touched the bottle immediately, but we need more duration on sit ups! Site version 2o2o we are working on it, but I cannot get her hopping on the object and she still need a stair for it. How can I get her doing it without an object? Great, sounds like a great learning opportunity for Ayoka! For the bowl to bowl trick, did you try with plastic bowls? If that doesn’t work either, simply try with her toys first, might make more sense for her to pick those up 🙂 The hug, train it with a pole and one leg first -- see some other videos to get the idea. For side legs, we’ll get to fading the object in next lesson 🙂 Happy training! Here is our second video for this week. Our greatest challenge has been getting both side legs simultaneously. Both Echo and Finn place their hind foot on and then their front foot. They’re clear that both feet go up but not that they should go at the same time. I think one of my challenges as a trainer is pushing forward the right amount and not plateauing. (I tend to have a woo hoo! moment and stay there too long…) Ideas, please? Also bowl in bowl is going fairly well with Finn, but I’m still at the lifting the bowls stage with Echo. I’ve changed the game a little so that I’m shaping them both to bring an item to a target and I’ve started with a large target (a bath towel) which I’ll decrease in size as they get good at the game. (Retrieve… not one of my strong suits, I’m afraid…). Heeling is going quite well. Today, after I made this video I started on Lesson 5 with Echo with the reverse figure 8 — all of a sudden she was so focused on the game that the target didn’t matter to her any more. She LIKES this new game. Thank you, as always, for your advice. Sorry about the “through a fog” appearance of most of the video -- someone licked the lens and I didn’t know it!! Great! Definitely jackpot it, ideally as soon as the two legs go up, before she even touches the object (and leans on it…). One more video clip before we move on to Lesson 5! Heeling still proves to be our most challenging. 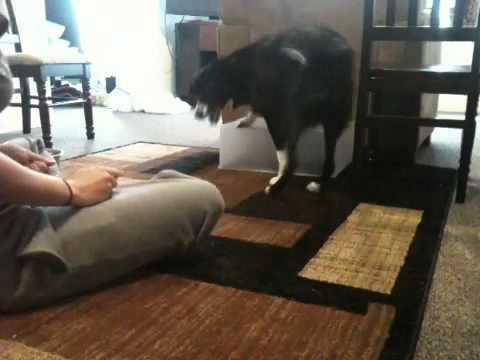 In fact, any trick that doesn’t start with a “prop” is tough to get her going on (“sit” is another example). Not sure how to help with that, other than patience and time. Thanks. 🙂 She was offering better side legs over the weekend, but I think you are right, and I’ll get out the flat board we had been using. This was the 2nd time I had offered something other than just the pole for hugging, and the 1st time I asked for it in more of a begging position. She seemed to hold onto the little stuffed bear, so I’ll keep trying with that one. Grit does seem to be a quick little study! Regarding bowl in bowl. Penny is picking up the bowls really nicely but I have trouble moving on. I try to push the other bowl underneath the one she’s picking up and jackpot if it hits it, but I feel a little stuck. How did the rest of you move on from picking up to actual stacking? Did you try rewarding in the other bowl? Or using another, significantly bigger object as the second object to make the probability of falling in it bigger? 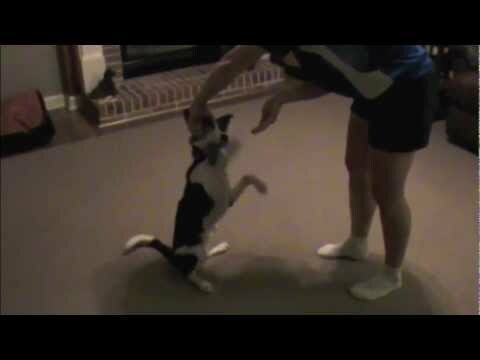 Here is a video of Swift working on heeling. As you can see she is a little confused as to why the heck I am in her way and she tries to squeeze between me and the box. She also doesn’t understand that she needs to circle and hit both sides of my legs. Any suggestions? I also tried to work on the side 2o2o and I can’t get her to put her back leg on it. I don’t really know where to go from here. I also want to do the “pee” trick but I’m not sure how to do that. Should I try using a target or should I use the 2o2o box and only click for one leg? I don’t want to confuse her 2o2o, so I haven’t gotten into the side 2o2o or pee trick. Thanks! Cool, what a nice, fast pivoting! She is doing great, we just need to fix your position. Don’t stand behind the target but at the side -- meaning that you need to move from one side to another when you want her to switch to another side -- you can also cue that with your hand. Also, don’t keep her circling from one leg to another, do some “glued to the leg” too: moving away from her and have her follow. 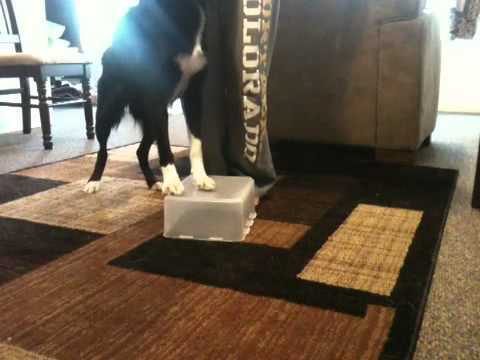 See some videos of others on where to stand, it will give you a better position (her paws where your heels are, not in front of your toes) AND will make it impossible for her to squeeze on the other side. For side legs and pee trick, she needs to know to step into 2on2off position backwards (not up and down like in agility, but backwards, directly with hind feet on). If you want to make it look completely different as agility 2on2off, you can start by putting a blanket behind her and cueing her to back up, rewarding for stepping on a blanket. You then make it higher by folding it, putting one book, two, three.. underneath and as soon as you get some more height, you can start clicking lifting the leg (vs. actually stepping on it). Once she knows it’s about lifting her hind leg, you can name it to get pee trick and then go to side legs trick, it’s easy once you have that one hind leg lifts. Great! And she is even hopping up with both at the same time sometimes, that’s a very good start for a handstand so jackpot those! One at the time though is better for pee trick and side legs, so you can start teaching those already now too, before getting too far with a handstand and loosing one leg lifts! I’m so proud of my 12 year old Sheila. She always wants to make some Tricks when I work with Ayoka, too. So last week I ahped the bowl trick and she got it in 2 1/2 minute! And look how much fun she had! Awww what a graceful and clever ‘old’ lady 🙂 Loved it! That tail never stops wagging -- what a wonderful and clever lady.